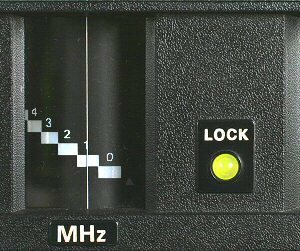 The function of the MHz lock lamp is to show when the synthesized heterodyne oscillator is locked. 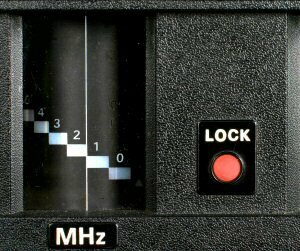 Adjusting the MHz dial to the desired frequency band will lock the system turning off the lamp. So the indicator is on when the synthesizer is unlocked and off when the synthesizer is locked. The modification is basically cosmetic, giving a clearer indication of synthesizer lock. The new circuit uses a 5mm tri-colour LED driven by a transistor switch. When Q111 on the RF unit PB-1526A is turned on (unlocked) the red LED is on. This turns on the first BC184L transistor, holding off the second BC184L and the green LED. When Q111 is turned off (locked), the red LED is off. 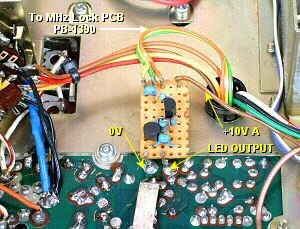 This turns off the first transistor switching on the second BC184L and the green LED. The new circuit is built up on a small piece of plain matrix board and soldered into position using two terminal pins. 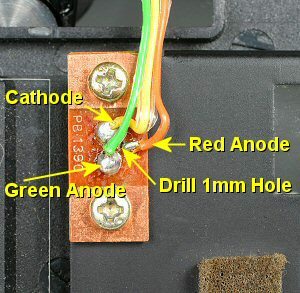 Before the 5mm tri-colour LED can be fitted, an extra 1mm hole must be drilled in the PB-1390 PCB at the position shown in the photo.